The Butterfly – Two gables which dip at the middle. Gabled – (Narrow or Long Gabled) One gable with two sloping downward roofs; the home has either a front or side entrance. A feature of this design was slot windows. Center View or Flat Roof – Either a front or side entrance was an elevated section in the living room area of the Mid Century Modern home. Single Slope – A flat roof over the garage or car port and near the center of the house. A taller vertical wall rises with a roof that slopes downward from the center to the buildings exterior wall. Folded Plate – V or W shaped units attached to each other creating a zigzag roof line profile. 2) Steel, Plastic, Concrete Use. 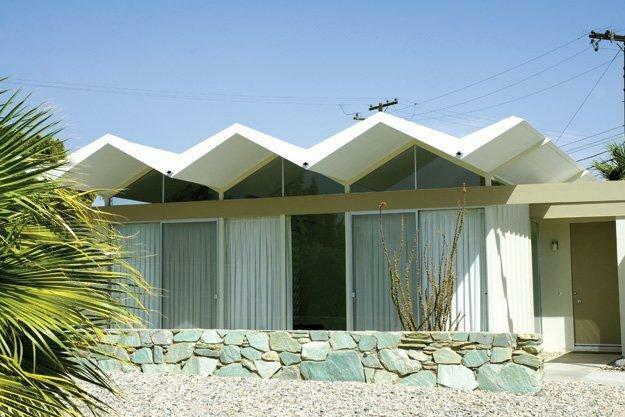 Steel and formed concrete were used extensively as was plastic in many Mid Century Modern home construction designs. Natural stone and wood were used on the interiors and exteriors to provide visual breaks and for the esthetics of natural material interest. 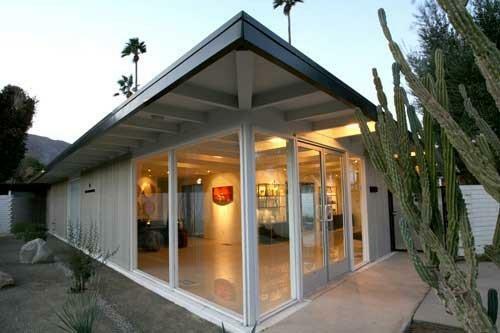 With the use of much glass in the Mid Century Modern home the use of wooden overhangs would provide shade to the interior spaces of the home during the hot and sunny days in the desert, but allow in the low winter sun. Post and beam ceilings were very popular in the 50’s in the Mid Century Modern home in a variety of styles. 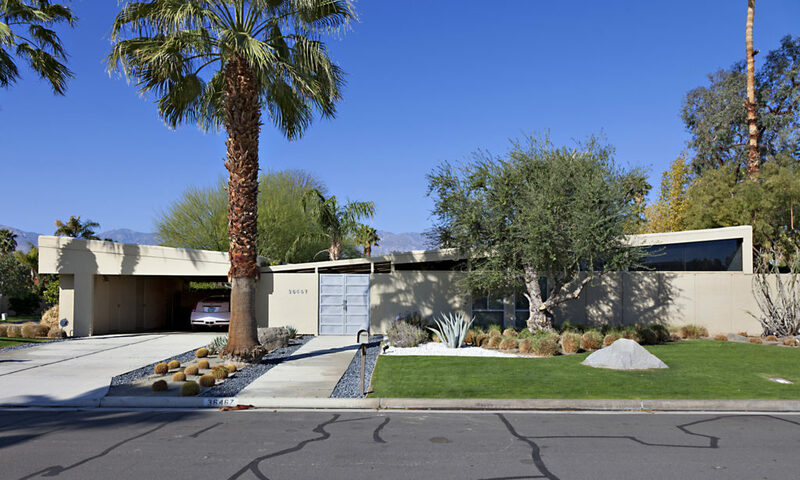 Many times clerestory windows were incorporated to give a better view of the San Jacinto Mountains, that are such a part of the beauty of Palm Springs! 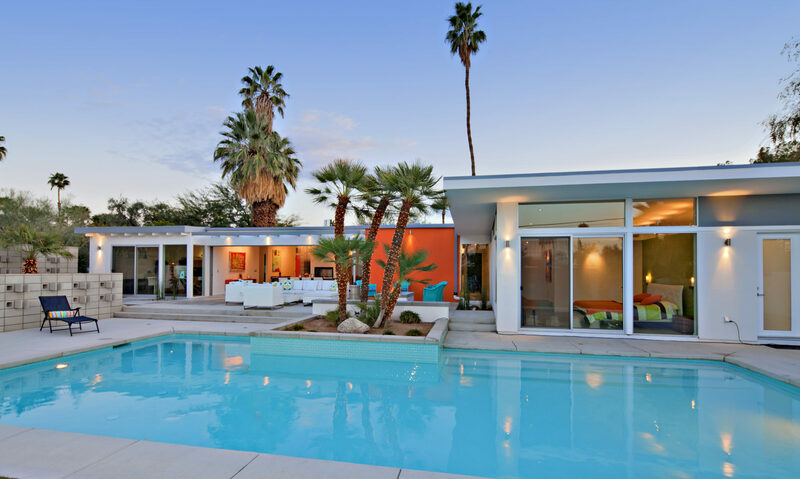 Mid Century Modern home designs incorporate outdoor living spaces as part of the overall design, with either a center interior atrium that can be covered or open air. Many have very extensive outdoor patios often incorporating another 50’s favorite, beautiful swimming pools!! With kitchens opening to the living room in many homes as well as some of the dens also opening into the living room. If you like homes with character, then it is likely upon walking through the door of a Mid Century Modern home, your face will light up. Why? Mid Century Modern homes are filled with personality and charm! With their very unique exterior and interior design, they will strike a special place in your heart! Mid Century architecture, up close, offers you a simper world of generations back and memories of a distant past. But, at the same time it brings both modern and stylistic trends in today’s urban world!